Rare Glover's Donkey possibly from Worcester which was a key area for glove making in the UK. The gloving 'donkey', an item of equipment that revolutionised the gloving industry, was invented in 1807 by James Winter of Stoke sub Hamdon. It is not known if James made any money out of his invention as records for him are somewhat scarce, however in the 1841 census 75-year old James was recorded as living on 'independent means' with his wife and two servants at Stoke sub Hamdon. James was also listed in the 1846 poll book for Stoke sub Hamdon by virtue of owning a freehold house and land. Winter's invention consisted of a clamp mounted on a wooden pedestal. The clamp was spring-mounted and operated by a foot pedal. 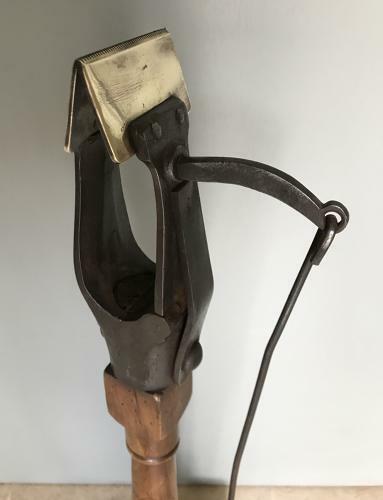 Along the edge of both sides of the clamp were strips of brass with evenly spaced teeth which held in the glove firmly but enabled the glove sewer to produce accurate stitching by using the brass teeth as a guide for the needle. At this time, of course, all gloves was stitched by hand and the even and accurate stitching the device enabled was an important step in glove manufacturing. During the nineteenth century all the glove manufacturers employed outworkers, invariably women and girls who worked at home sewing gloves. The gloving donkey enabled more accurate and speedy glove production, even enabling girls as young as eight years of age to produce work of an acceptable standard. The gloving donkey was in constant use until the gradual introduction of the sewing machine in the 1880s.